As promised, today we look at one of the more wearable crown jewel sets: the Danish emerald parure. And just what are we looking at? 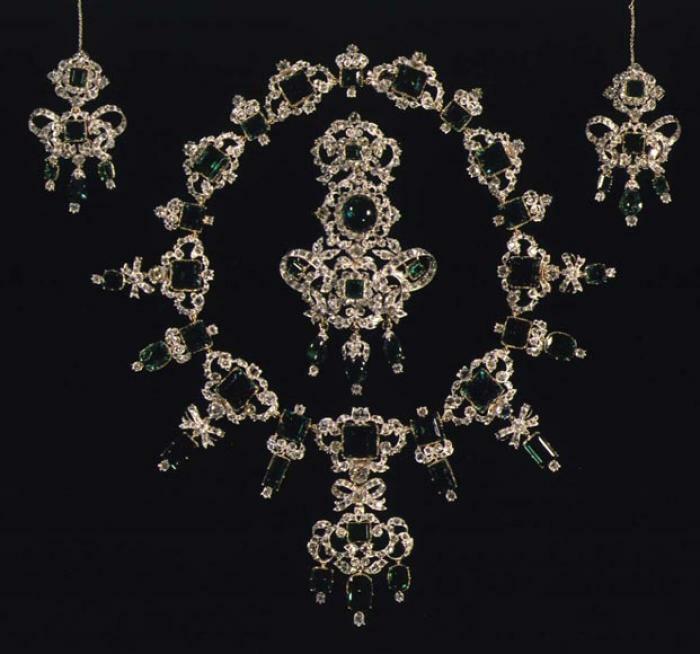 In total: 67 emeralds and 2,650 diamonds composing a parure of a tiara, necklace, earrings, and brooch. 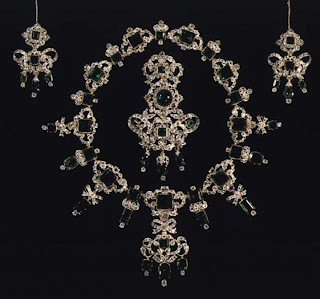 The brooch itself can disassemble into three smaller brooches, and can also serve as a pendant for the necklace. As you would well expect with anything falling under the “crown jewel” category, this history here is rich: the largest 26 emeralds date from 1723, when they were a gift from King Christian VI to Queen Sophie Magdalene for giving birth to the future Frederik V. The rest of the emeralds belonged to Princess Charlotte of Denmark, and the diamonds used also previously belonged to the royal family. The whole thing was put together by C.M. Weisshaupt in time for Queen Caroline Amalie to wear while celebrating her silver wedding anniversary with King Christian VIII in 1840. As I said, this set is a part of Denmark's crown jewels. Queen Sophie Magdalene was actually the one that started the crown jewel tradition when she left some of her jewelry for use by future Queens in her will. Until 1914, the current queen had possession of the crown jewel sets; Queen Alexandrine sent them to Rosenborg Castle for keeping and they were eventually put on public display. They’ve stayed there ever since, though of course they are made available on demand for whichever queen has the authority. And that’s part of the trick of these crown jewels: only the queen has the authority to use them. Queen Alexandrine didn’t feel the need, hence sending them away, but her successor Queen Ingrid certainly made good use of them. And Ingrid’s daughter Margrethe has done the same. 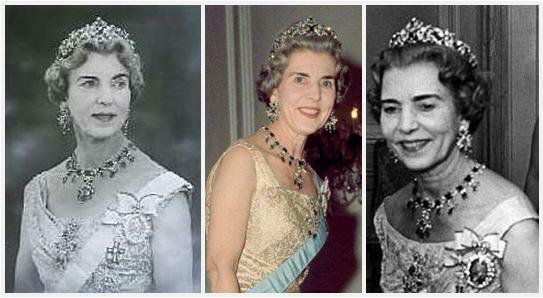 The emeralds certainly aren’t among the most used jewels in Margrethe’s repertoire, but that’s understandable. It’s probably easier to use the ones that you have in your possession rather than sending out for the crown jewels; plus, you have the whole concept of saving them for important occasions. Another catch comes into play here as well: these gems can’t be taken outside of Denmark, so wearing them at foreign royal events is out of the question. I love this tiara, even though it has less of a "wow" factor than, say, Norway’s green headliner. But I've never been a fan of the necklace, and I'm always too distracted by that to pay much attention to the tiara. The emeralds are just so, I don't know, overwhelmingly rectangular, I suppose. Is this “crown jewel” worthy for you?